Here are some web banners - just paste the HTML below into your website. More promotional materials will be available shortly - can you help? Get in touch if you can make some artwork for us! 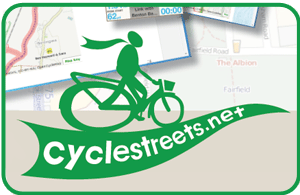 Plan your cycle journey in Croydon with CycleStreets! Thanks very much to Ayesha Garrett who produced banners 2 and 3 for us, at no charge. Box 1 is by Surrey Heath Borough Council, to whom we are also grateful. Thanks very much to Ayesha Garrett who produced this folded flyer for us. Use the order form to obtain printed copies. Thanks very much to John-Paul Shirreffs who produced these for us, at no charge, at short notice.